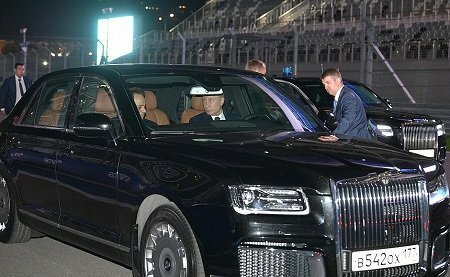 Vladimir Putin’s limousine is nothing short of impressive. One thing that immediately pops out when looking upon the vehicle is its uncanny resemblance to a UK Rolls Royce. But the similarities are only cosmetic. The cover of the vehicle is armour plating, in order to provide the utmost protection for its passengers. The vehicle is not small either: it is about 22 feet long and 5’5 inches tall. Other than the armour plates, it features bulletproof windows and tyres reinforced with Kevlar. Another curious feature you’d find on The Tank is an electric engine, which, if need be, doubles up as a generator. According to the experts, this limousine can be completely submerged in water and keep dry on the inside, though this is one thing that’s not been put to the test. It makes for a spectacular vehicle that is worthy of presidential transportation. If there is one thing about the US presidential limousine that defines it, it has to be tradition. The current limousine is quite similar to the limousine that President Obama used. In fact, he was the one who initially ordered this model of the vehicle. Since his time, The Beast has seen a few upgrades, however. The current limousine features heavy armour with thickness of at least 5 inches. Even the windows of this vehicle are super durable and made for protection – with 5 layers of polycarbonate, it is hard to think anything can penetrate them. All of the doors close in such a way as to seal the limousine 100%, making it impervious to chemical attacks. There is armour on the tyres, which are fully resistant to punctures. Even the fuel tank has armour plating. The limousine is also rich in cool gadgets. The president has the option to contact the Pentagon and the Vice President via a satellite phone tucked in the rear armrest. There is a wide range of GPS tracking and communication systems inside. The Beast can bite too – it has tear gas cannons and pump-action shotguns ready to repel any threat. Technically speaking, this isn’t exactly a Cadillac, being 5’10 inches tall and 18 feet tall. The estimated cost of the limousine is around $1.5 million, and the Secret Service actually has 2 of them, just in case. It doesn’t take to be a petrol-head to feel a sense of respect towards these limousines. It takes ingenuity and masterful engineering to fit all of their features and still retain the comfortable ride and security that limousines provide, but both achieve it masterfully. They may not be available to the wide public, but nonetheless, they are spectacular examples of what limousines are all about.